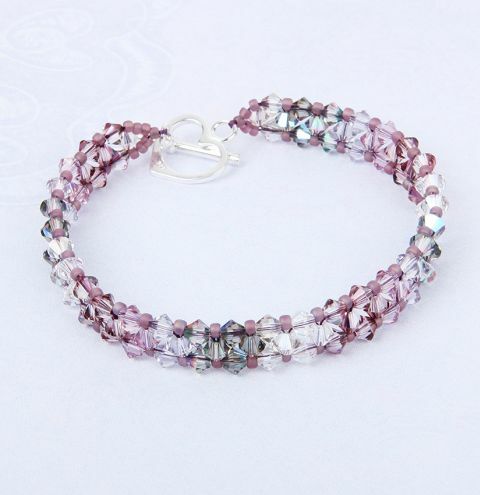 Learn how to make a stunning bracelet with Swarovski crystal bicones in delicate shades of pink to lilac! The perfect gift for someone special! This bracelet will require 94 Swarovski 4mm bicones to make a bracelet that measures 7 inches. Thread a needle with approx. 2 metres of thread.Decide on the order you want to add your bicone beads along your bracelet. Separate your 5 colours of bicone beads and label them A, B, C, D and E.
Pick up 4 x colour A and pass them down the thread leaving a 30cm tail. Thread through all the beads again and again until you exit on the opposite side of the circle as shown in the diagram. Pick up 3 x colour B and pass back through the last crystal you exited from. Thread around this new group of 4 beads again and exit through the endmost bead as shown in the diagram. Repeat the pattern, adding a new group of 3 bicone beads in the next colours until you've used as many bicone beads as you want to, or have reached the full bracelet length you need. Put 4 x bicones to one side. Remember to leave the bracelet approx. 3cm short as you will need to add your clasp and some seed beads to either end. When you get to the desired length, pass back through the beads until you get to the first bicone in the lower horizontal row. Pick up a seed bead and thread through the next horizontal bicone. Repeat this along the bracelet, then change direction and repeat along the top row. Once you've added both rows of seed beads, exit through the endmost horizontal bicone bead, pick up 1 x seed bead, 1 of your spare bicones, 4 x seed beads and one half of your toggle clasp. Thread back down through the 4th seed bead. Pick up 3 more seed beads, 1 x bicone and 1 x seed bead. Thread through the other endmost horizontal bicone. Next, tie off your thread. Weave in your thread to secure the design. To do this, weave around the last couple of inches of beads, following the bead path. Make half hitch knots along the way and continue to weave until you are confident it won't unravel. If you have enough thread you can weave all the way to the other end of the design and knot it to the tail thread. Repeat step 5 on the other end of your bracelet using your tail thread. Weave in this thread securely and trim off any excess threads once you are finished.